17-May-2011 -- We crossed from Helsingborg to Helsingør where we visited Kronborg Castle , outside Denmark probably best known as Elsinore in Shakespeare’s Hamlet. The weather was good. It took us an hour assisted by the car’s navigational unit to reach a point in an area with many typical summer houses. We stopped in a road called Myrvej where we found a sign post pointing to a public path between the summer houses and into a forest which was being thinned. A small deer ran away as we approached, birds were singing in the trees and a jogger passed us along the pathway. 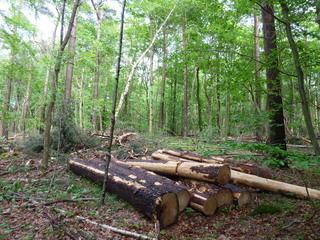 Big trunks of pine, beech and maple were waiting to be taken away. The confluence point was just 10 – 12 m from the path. We then drove south towards Copenhagen where we were lucky enough to get tickets for a ballet performance in the Royal Theatre, a beautiful 250 year old building.